Lisa's progress! @duhquilts on Instagram. What I LOVE is the diversity of color palettes. This group is making the patterns their very own! 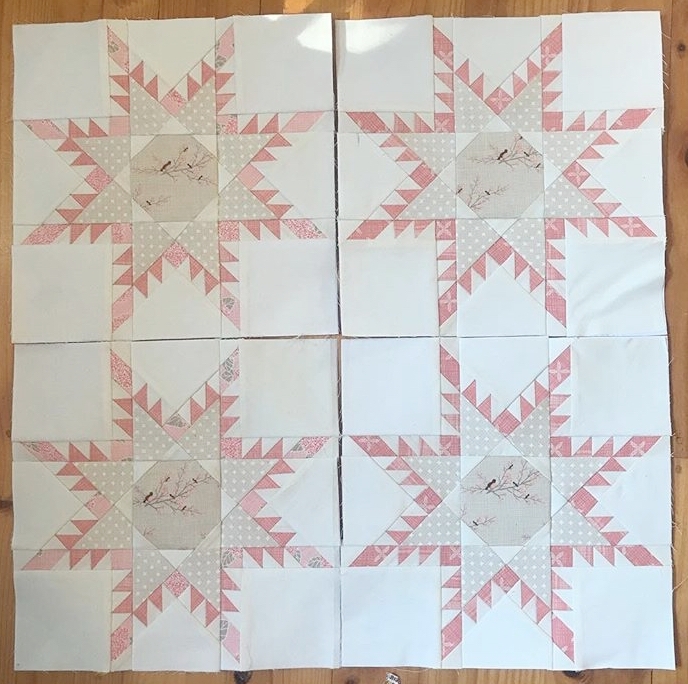 JessicaQuilter made her own layout design using the 20" feathered stars. Look at her beautiful quilting! Lisa @shiraz_and_sewing is using soft pink and blue tones (see her Instagram feed for more) and they are fabulous! YOU CAN DO IT! Keep going, I promise it'll be worth it in the end! 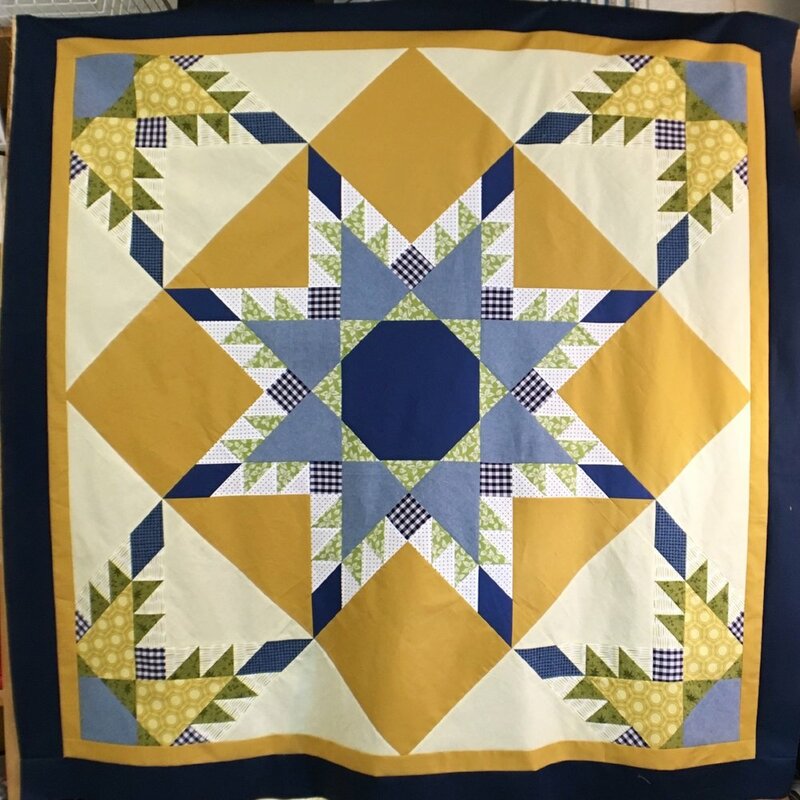 In the Facebook group last week, I posted an option of adding a flying geese border which increases the size of the Sampler & Blizzard quilts to 90" square. Check it out if you are interested! I hope you enjoyed the break from the QAL last week. We're back at it today with Week Six! The 8" blocks can be found starting on p.39 of both the Snowflake Sampler and the Feathered Star Blizzard patterns. Star Flurries folks, the 20" stars are nothing new to you. ;) You have SIX total left! Maybe you'll want to batch sew them? Maybe you'll want to enjoy the leisurely pace right up to the end of the QAL? The choice is yours! This week of the QAL is sponsored by Lindsey Neill of Pen + Paper Patterns! Before I kicked off this QAL, Lindsey helped me get the word out by making her own 36" Fierce Feathered Star. It's one of my favorite to date! Photo courtesy of Lindsey Neill. Lindsey is a wonderful designer and has lots of cute patterns! Check out her Craftsy shop for her beautiful work. Lindsey's Sewology quilt made it onto this beautiful V-neck tee made by Patchwork Threads! She'll be gifting the winner of this week's drawing with a gift card to Patchwork Threads so that you can order it in your size. Image from Patchwork Threads, click here to get the details! Follow @penandpaperpatterns on Instagram to keep up with all of the inspiring things she does, and thank you so much, Lindsey! Mini Modern Heart tutorial video is live! This pattern is just too perfect for beginning foundation paper piecers to pass up! I HAD to record a video tutorial for it, too. ;) I'm kind of on a roll having uploaded the series for the Fierce Feathered Star less than a week ago. AND I have an unreleased pattern and video tutorial just waiting in the wings for you all, too! But that'll have to remain a tease for now. Back to the Mini Modern Heart. I love this pattern for using up scraps. These templates allow for small scraps to be used, too. I can't help loving scrap quilts! There's an economic element at play for me, it's like a bonus quilt because you didn't "buy new" [fabrics] for it. And it's always fun to revisit some really great prints that you've used for quilts from your past. It's a trip down memory lane! But you don't HAVE to use scraps, charm squares (5" squares) would be perfect for this pattern if you're into buying and/or collecting pre-cuts. The video that I recorded is just under 30 minutes and will cover everything to need to know for successful foundation paper piecing, even if it's your first time! Just popping in to say that I hope you enjoy this week to catch up or take a break! Check back in next week for Week Six! Video series for the Fierce Feathered Star pattern is now available! 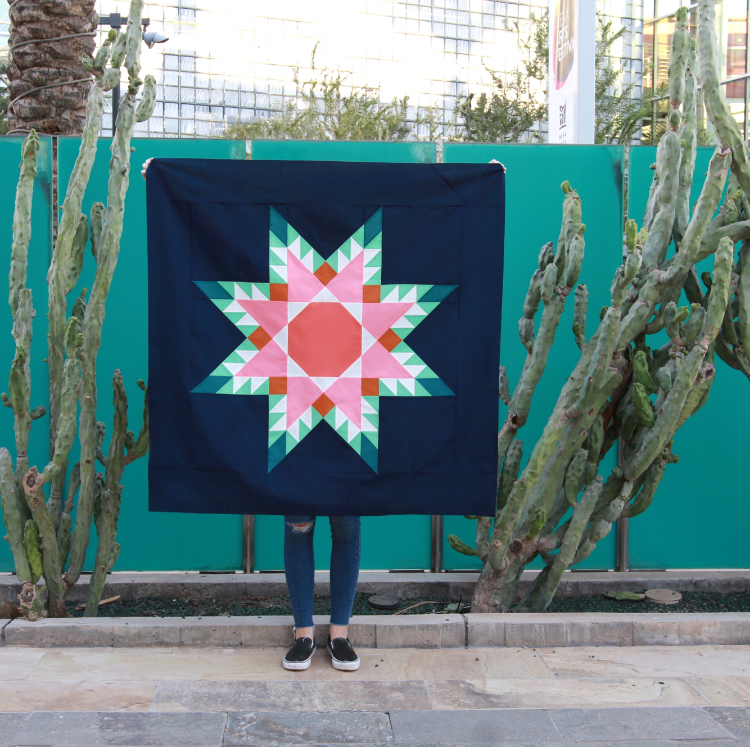 I love the Fierce Feathered Star block! There is no paper piecing involved, there are no y-seams to negotiate. But even so, it has intimidated some quilters. I know because they tell me. :) Haha. I'm here to remove the mystery about sewing this block. What better way than to show you every step? The videos are all completely free, you just need the Fierce Feathered Star pattern for your own templates and cutting dimensions. Click here for the entire video playlist. I hope watching the steps will you give you the confidence to tackle a project that might challenge and grow your current skill set. That, my friends, is so exciting to me! Hellllllllllllo, Club 129! How is it going? Star Flurries participants: You know what to do! By now, you're an expert! Go ahead and cut everything in the Putting it all together cutting section toward the end of your pattern, even though we will not use all of the pieces this week. As for the first sewing assignment, complete the instructions on the bottom of p. 64 (Sampler) or p. 46 (Blizzard) under the Inner borders section. Don't worry, it's two tiny seams and some trimming. Piece of cake! The bulk of this week's work will be completing pp. 65 & 66 (Sampler) or pp. 47-49 (Blizzard). We will be using the Magic 8 method for making half-square triangles as detailed in the pattern. I just wanted to mention here that the HSTs are intended to be a little oversized and trimmed down to exact specifications. As you're sewing the larger squares together, try to align the outer edges as best as possible, but don't worry if they end up like the next photo. I don't pin the squares together or go to any other heroic measures, the trimming step will make them perfect! I set my stitch length is a little shorter (2.2) than what I normally use to discourage unraveling after all the cuts are made. This week of the QAL is sponsored by Tara Curtis of WEFTY! If you have not seen a WEFTY needle before, you neeeeeed to check it out! There are crazy-amazing designs that can be accomplished with these small but mighty tools! Tara is generously awarding a prize pack of WEFTY needles, her Woven Stars variation pattern, an EZMiter AND the EZMiter baby quilt pattern! Basically, she's spoiling us! Thanks, Tara! Follow her on Instagram for innovative and inspiring projects! Would you believe that we've had our first top finish?!?! I know!!! Donna Barrieau shared this in our Facebook group! Isn't it incredible? And not to mention that she got this accomplished during Week Three! Beautiful work, Donna! Thank you for inspiring us... and making us envious at the same time! :) HA! Wishing you a productive week! Don't forget to join our Facebook group to connect with other QAL participants!